National League rivals Halifax and Grimsby will contest the FA Trophy final at Wembley on Sunday, 22 May. Halifax beat seventh-tier side Nantwich Town 6-4 on aggregate to secure a first trip to Wembley in the club's history. 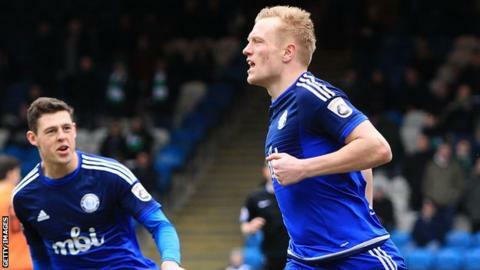 Jordan Burrow scored both goals as they drew Saturday's semi-final second leg 2-2 in front of 3,009 fans at The Shay. Padraig Amond scored both of Grimsby's goals as they beat Bognor Regis 2-1 in their second leg at Blundell Park to complete a 3-1 aggregate success. Meanwhile, Hereford will meet Morpeth Town in the FA Vase final, which is to be staged on the same day. Hereford won 2-1 at Salisbury in their second leg, the Bulls going through 3-1 on aggregate, while Morpeth's Luke Carr scored an injury-time goal to earn a 4-3 aggregate win over Bowers & Pitsea.